Last Child in the Woods, by Richard Louv, is a quintessential handbook to the ways that the natural environment impacts children. Over the three hundred so pages of text, Louv makes a case for why nature is important, what the benefits are to not only children but all of us, and how this “frontier” has changed over time and how it will continue to change, and what we can do about it. I don’t think many of us in this generation have to look far to see evidence of how much the world has changed since we were children, but some might not have stopped to understand the legacy implications of this. For myself, reading this book was a bit like Louv “preaching to the choir”, and I am curious if anyone outside the “choir” would be able to sustain interest throughout the whole thing. Even for someone like myself who was interested already, it was hard to wade through the early rhetoric. At the same time, having finished the book I do feel like I have a broader understanding now of the bigger picture, and am more inspired now after reading it to actually make changes not only in my life, but in my children’s lives, and perhaps other children around me. 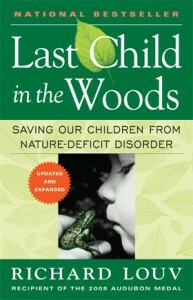 At the end of the 2008 edition of this book, it lists 100 Actions We Can Take, which include both activities with children and within the home, and ways we can act locally and nationally to open up people to the wonder of nature and inspire them, or change practices, to become more conservation minded, to save nature before it is all taken away, to get children out and involved in it, and to understand the value. This is a valuable list that you might find yourself returning to time after time as a guide. I know I will return to it, and to the book as whole, to keep myself focused on making this world a better place.